Just to be clear, I still think the Apple watch is the best of a generation, that is, the first smart watch generation. But I’m already looking to the next one and with the Samsung Gear S and LG Urbane, I think I already see it. First the Gear S. I’ve been using it for 2 weeks as I gave my trusty LG First gen a rest. Notice I said it was good, not great or I love it. There are things about the UI that bug me, lack of apps, and I miss my integration with the Android system and Google services. But after a few weeks, the design, size and the key functions the watch does perform have won me over despite its initial size and previous listed issues. The first thing that really surprised me is the curved screen is way more functional then I expected, but not so much from a UI/UX point of view, but the fact I can easily extend my arm and expose the watch! Such a simple thing. And when I lower my arm, my shirt sleeve smoothly covers it again. My LG and the few days with the Apple watch did not do this despite being smaller watches. Even the round Moto gave me issues. After a few weeks, what I though was a large clunky looking watch started to grow on me which is even more surprising since I got the white band instead of black like I would normally do. The second very useful thing was wifi support and taking calls on the watch. (I did not spring for a sim card). The sound was clear and I found it was just as easy to take a call on the watch if I was in a quite room. Basically as an everyday watch, the Gear S form factor is better than I thought. It’s comfortable, quick to get used to seeing on my arm and my clothes do not get hung up on it. More importantly, I have plenty of screen real-estate. It may not happen overnight, but I think we will see this size curved smart watch more and more and people get used to seeing it, just like when the first large phones came out. 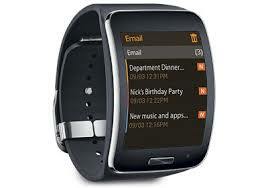 The Gear S form factor is just one direction in the second generation of smart watch design. The LG Urbane will set the tone for the watch as a design artifact. Not for everyday work, but for going out, special occasions, etc. In other words, I can see some people owning two watches as people used to when I was young. I have the Pebble Steel with a nice leather band and tend to wear that when I go out. I will be watching the price on the Urban ( I tend to buy used ) and most likely will use that as my replacement when the price drops enough. As nice as the Apple watch is, it still looks like a throw back to the first attempt and smart watch design. Sure Apple is already talking about the Apple 2 watch, but from what I understand, the form factor will be the same. Old.